GraphCut is our range of cutting machine. There is two types of cutting machines: single-ply and multi-ply. Developed for more than 20 years, those make cutting of many flexible and technical materials way easier. Single-ply cutting machines exist in static or dynamic version (Conveyor). The multi-ply cutting machines are designed with a conveyor with different compressed cutting height depending on the needs. The GraphCut® single-ply conveyor solution is a machine suitable for cutting flexible materials with an automatic continuous feed. This machine will assure the totality of the cuts of your workshop round-the-clock if necessary. The material is automatically fed by the conveyor and the unloading of the cut pieces is at the end of the table on an unloading area defined by the operator. The beam and the cutting head move on the axes using a rack and pinion system. A turbine system, to create a depression on the table, ensures the immobilization of the material during cutting to obtain the required cutting quality. 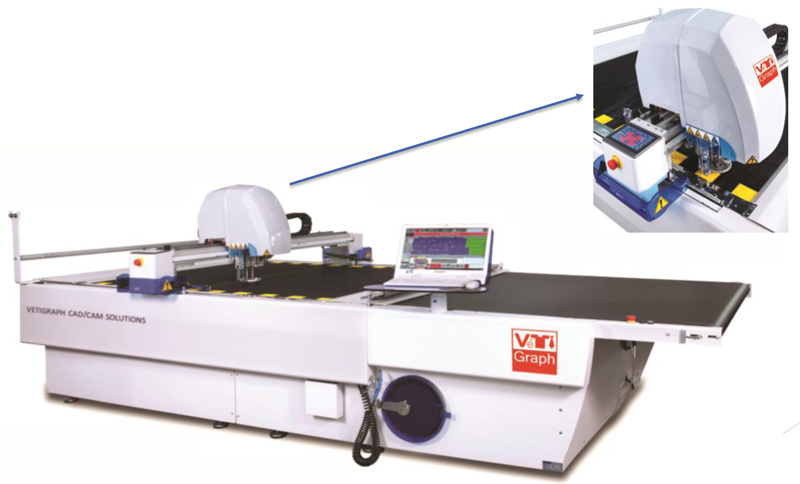 This machine is capable of cutting, marking and punching at speeds up to 1.5 m/sec with a precision of about +/- 0.25 mm. The range of tools offered on this machine includes a non-motorized tangential blade, a motorized rotary blade, an oscillating tangential blade, a punch, a pen marking system and an inkjet marking system. This wide range offers the possibility to cut materials up to 15 mm thickness. GraphCut multiply Conveyor® is a cutting automat that is easy to use, efficient and adapted to your structure, whatever the size of your series. Combined with our Graphcut marking software, it minimizes material losses while ensuring minimal cutting time. 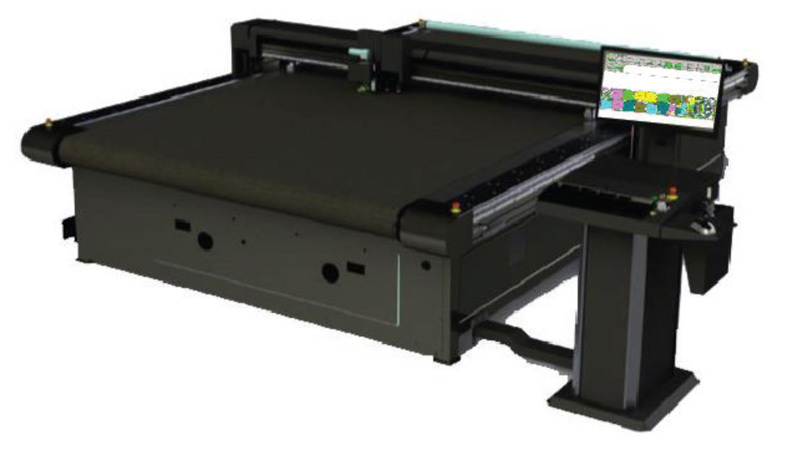 Its large cutting capacity (up to 75mm thick compressed) ensures optimal productivity and incomparable quality, whatever the type of material and the complexity of the style.